About 40 hectares of cereal crops and another 40 hectares of grazing land are under threat at Arda Transsau. 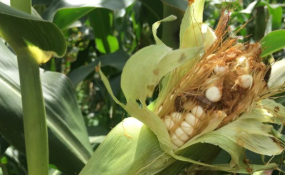 Manicaland provincial agronomist Mr Thomas Sakuhuni said reports from some parts of Makoni District indicated that 4ha of maize crops had been completely destroyed by African armyworm while another 40ha of cereal crops were attacked. "Chemicals to control the pest have been delivered to areas which were affected. Agronomists are also helping farmers in spraying the affected areas," said Mr Sakuhuni. "We are applying pesticides commonly used on the familiar fall armyworm or the stalk-borer, with little success and we are also advising all farmers to worry about the African armyworm and start to spray their crops now before it's too late. The African armyworm is a real threat and it mostly attacks in cropped fields, pastures and veld areas. The hotspot areas are Marange and Mutasa." He added that they were also training farmers on other measures to control the worm. He urged farmers in nearby areas to be on guard against African armyworm adding that the pest had the potential to spread widely in some areas which had not been affected.